This isn't the full story, Greg. As you well remember, Fetzer tried to become the straw that stirs the CT drink. He published a couple of anthologies, and then began claiming everyone who contributed to his anthologies was the top expert on this and the top expert on that. He then used used the supposed expert status of his "all-stars" to bully and berate everyone who disagreed with him. He liked to pretend, moreover, that his experts were all in agreement on anything of substance. He would then use their purported like-mindedness as an argument for their accuracy. But the center would not hold. He kept expanding his family of experts to the point many of them were in conflict with one another. Doug Horne strongly disagreed with Jack White re 9/11. John Costella fell out over Fetzer's support of Doug Horne. Jack White and David Lifton fell out over Fetzer's support of Judyth Baker. And you fell out, finally, over his support of Ralph Cinque. I think Cinque then fell out over ??? (I really don't care.) But the point is that, outside of Mantik, who never broke away from Fetzer, you were one of the last to leave, and only did so when Fetzer insulted you personally. For years and years, you sat by while your friend Fetzer pushed all sorts of crazy/sloppy nonsense on this forum, while attacking those who weren't falling for it (e.g. Tink Thompson, myself) as being either CIA shills or incompetent know-nothings. I'm not one to hold grudges. I would go out with you and get a burger right now if you wanted to shoot the shirt. But the fact is that you chose to associate yourself with Fetzer for a very long time, and for a very long time after it was obvious to the rest of us that he was both a bully and an extremely sloppy researcher. You can't just walk away from that. Your association with Fetzer has had a negative effect on your credibility. With me, and I'm sure with many others. Suuuure, Pat, that must be the answer. Those pesky FBI and SS devils, what won't they try to get away with when no one is watching? Let me guess, not enough time for three shots so they moved the first shot back up near the corner and called it 8 seconds, right? The location of the fatal head shot is clear when one studies the films. It was just past the Newmans. No one honestly disputes that. So how could both the SS and FBI place the shot well past its actual location, after initially getting it right, and closely studying the films? They couldn't, IMO. As a consequence, I suspect they lied about the location for a reason. Now, I went round and round over this with Tom Purvis. For years. He refused to believe the SS and FBI would lie about something in their reports, and felt certain it was Specter and the WC who lied when they said the head shot was at 265 ft. He claimed the third shot just after the head shot was in fact the Connally shot. When I found the early SS and FBI reports in which the shooting sequence was identified, in which it was claimed the second shot hit Connally and the third shot was the head shot, he couldn't handle it. The SS and FBI reports were lies. The WC's job was to make these lies palatable for a skeptical public. Thus, the May 24 1964 re-enactment. Thus, the single-bullet theory. According to Mary Ann Moorman, she heard the first shot as she took her famous photo. She then heard two more shots after she took her photo. James "Ike" Altgen, an experienced journalistic photographer, testified to the Warren Commission he was no more than 15 feet from JFK at the moment of the fatal head shot, yet he is not seen in this position until z350. He is nowhere near JFK at z313. Assuming the limo was travelling 12 mph or 17.6 feet per second, we should be able to calculate the distance between z313 and z350, also assuming Zapruder's camera was exposing 18.3 frames per second. 350 - 313 = 37 frames. 37 / 18.3 = 2.02. This is not the additional 42 feet further down Elm St. claimed by the FBI in WCD 298, but Altgens definitely places the limo much further down than the Zapruder film shows us. Altgens also heard the first shot at almost the precise moment he took the famous Altgens 6 photo below, which corresponds to frame z255 of the Zapruder film. Here is the full testimony of James Altgens to the WC. You can't just walk away from that. I most certainly can and I have! Pat Speer said: Your association with Fetzer has had a negative effect on your credibility. With me, and I'm sure with many others. Guilt by association is not logical, but that has never stopped you before. Rather than address the many issues you are now engaged in yet another fallacy: Poisoning the Well. You may as well claim that: "Since Burnham once was associated with Fetzer, there is no need to consider his arguments, as they must be flawed." You have again succeeded in redirecting the topic away from your inability or unwillingness to address the issues. It's not a fallacy, Greg, as the "guilt" to which I referred was not the "guilt" of your associates, but your own. You were a Fetzer cheerleader. You remained a Fetzer cheerleader until his bullying turned on you and your family. You then distanced yourself from Fetzer. That's fine. But you still emulate his behavior. It's like Frank Sinatra, Jr. touring with his dad's band. He can't help himself. In case you can't recognize this in yourself, here's the M.O. 1. You start threads on the Forum pushing the findings of people who are not members of the forum. 2. You then serve as a go-between and cheerleader between these non-members and the forum, when these non-members should simply join the forum if they want to comment here. 3. When the thread starts to go astray, you chastise those throwing in their own two cents, who take the focus off your intended subject of discussion, or intended target. 4. You then start a new thread with a slightly different slant. This both increases the exposure of whatever or whoever you're championing, and decreases the exposure of those who've already responded in a way that damages the cause you are championing. 4. When someone opposing your champion makes a point that seriously damages the cause you are championing, you obfuscate and dodge with desperate arguments, such as claiming the use of an anatomy drawing (as opposed to a photo) is misleading. 6. When someone responds to your bullying in a manner not to your liking, moreover, you insist that this opponent is "intellectually dishonest" or has committed the "fallacy" of this or that. So, here's the challenge, Greg. If you don't want to be tainted by your long-time association with Fetzer, stop emulating him. Geez. I feel like I'm in a debate with Trump, Cruz, or Hillary! I will address each of your points above if / when you address the many red items in the article, which is the only subject that this thread is about. Those pushing that the film is fake and that the head shot happened just in front of Altgens (because Altgens said so) inevitably avoid that Altgens long insisted that 1) all the shots came from behind; 2) there was a lot of blood on the front of the head (he mistakenly claims the left side of the head); and 3) all the ejecta from the fatal shot came forward and at him (an impossibility if the fatal shot came from the front and exploded out the back of Kennedy's head). He is a mixed witness, at best. My thanks to Robert Prudhomme for bringing Warren Commission Document 298 to my attention, and to Jim DiEugenio for putting it in context with the April 27th memo from Redlich to Rankin. And again thanks to Robert for helping me make sense of it all by posting information gathered from the testimony of Mary Moorman and James Altgens, which places the the limo for the first and final shots (sans Z-film dependency).. If I understand correctly, Moorman's testimony agrees with Altgens' regarding the first shot, and this gives me confidence in their testimony. But there is one thing I'm not sure I understand correctly. According to both Moorman's and Altgens' testimony, the first shot occurred when the scene was as depicted in Z-frame 255. Okay, so they agree with each other. Problem is, JFK had already been hit prior that. Right? 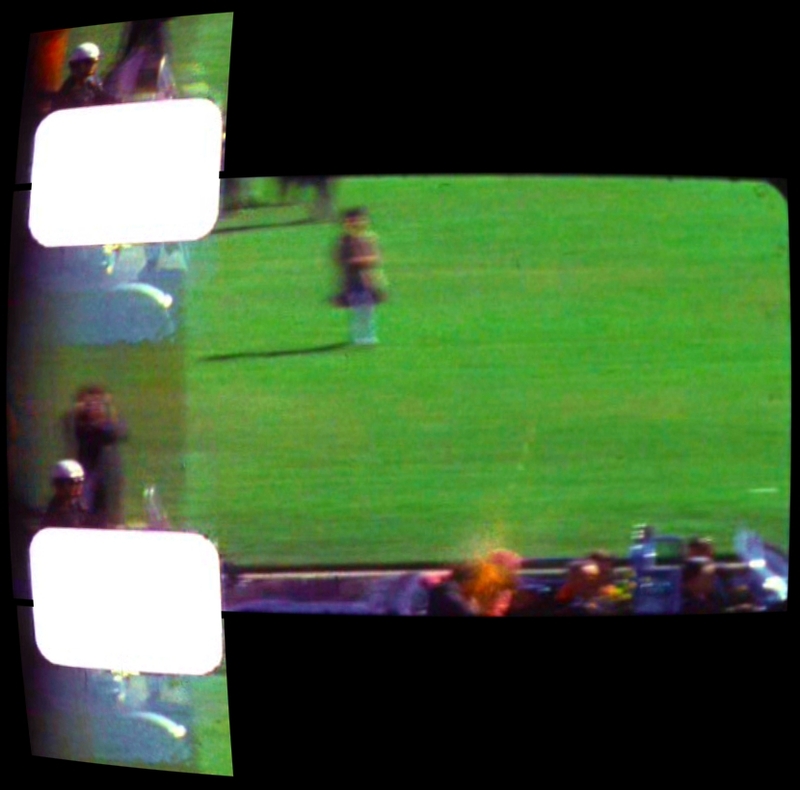 The Z-film has JFK being shot more than 1 1/2 seconds earlier. Of course, the Z-film could be wrong. But if we consider only Moorman's photo, JFK had to have reacted very quickly to the shot. The problem with this hypothesis is that one has to figure out from where the extant Z-film got its frames depicting Kennedy bringing his hands up toward his throat just before slumping. Moorman shows only the slumping part. (2-15-69 testimony in the trial of Clay Shaw) “as the Presidential limousine approached me I stepped forward to observe closer in order to take a picture, that is what I planned to do and just what I did....I heard three noises and they sounded like firecrackers.” (1997 interview on KRLD, as posted online by Debra Conway) "Uh, just immediately before the presidential car came into view, we were, you know, there was just tremendous excitement. And my friend who was with me ( Jean Hill ) we were right ready to take the picture. And she's not timid. She, as the car approached us, she did holler for the president. 'Mr. President, look this way!' And I stepped out off the curb into the street to take the picture and snapped it immediately. And that evidently was the first shot. You know I could hear the sound. and…" (When asked if she recognized it as a rifle shot) "Oh no. A firecracker, maybe. There was another one just immediately following which I still thought was a firecracker. And then I stepped back up on to the grassy area. I guess just, people were falling around us, you know. Knowing something was wrong. I certainly didn't know what was wrong”. (Appearance in Discovery Channel program Unsolved History: Death in Dealey Plaza, first aired 2-26-2003. 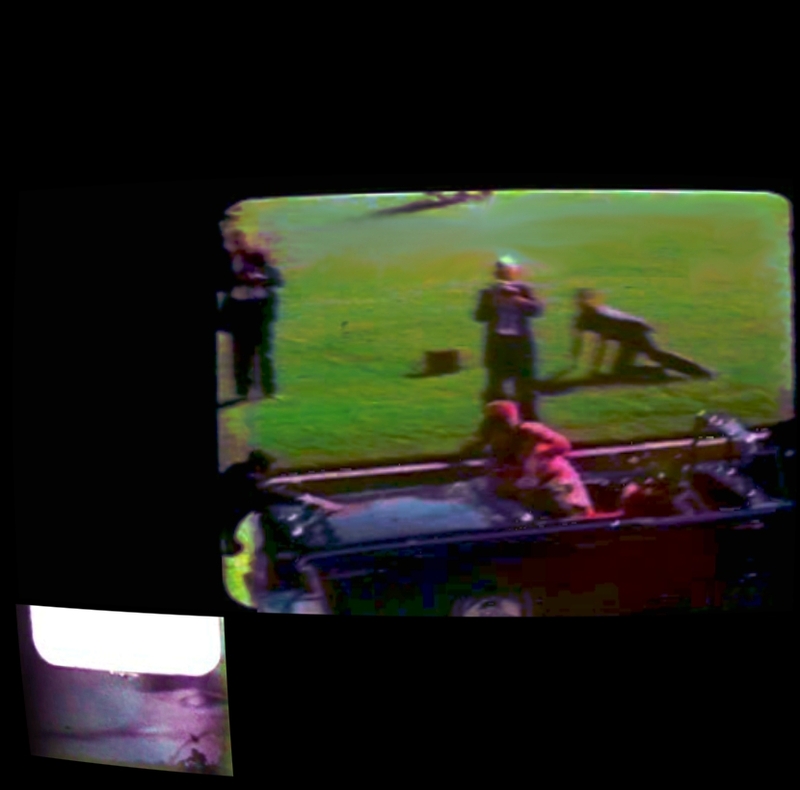 Transcript provided by James Fetzer) (Moorman is standing on the grass where she is seen in the Zapruder film) "I just stepped to the, uh, to the edge here, and Jean is hollering, "Look Mr. President, look our way!" and then I snapped the picture, which was at the same instant, evidently, as the bullet hit him, not realizing that's what had happened. But I did hear a noise, and then I could see people around me falling to the ground, or running, and doing--and that led me to know that something was happening." (April, 2007 interview on KRLD) (When asked how many shots she heard) "I heard three." (When asked what they sounded like) "I stepped up to snap a picture and at the instant that I snapped a picture there was a shot. And I know I stepped back a few steps and another shot. And then there was another one shortly in a matter of seconds...The first two were closer together than the last one." (News interview found on youtube, in which Moorman discusses deciding to sell her photograph, 2008) "My thought was those are firecrackers, not shots." (When discussing her photograph) "It just so happened it was the same instant that he was hit. And that was the first shot." (On the possibility there was a shooter in front of Kennedy, on the knoll) "Whether there was or not, we may not ever know." (5-24-11 interview conducted live on iantique.com) (When asked if she'd stepped out into the street to take a photograph of motorcycle officer McBride, before Kennedy's arrival) "Yes." (When asked if she'd stepped out into the street to take a picture of a second motorcycle officer, George Lumpkin) "Yes, I did, because he was in the middle of the street." (When describing the shooting) "I had been in the street to take the picture of Lumpkin. When the limousine turned the corner, it was coming towards me and I focused--I don't know if I focused--but I looked in the camera to watch the car as it approached, and uh looking up the area, waiting for him to get close enough and Jean hollered 'Mr. President look this way, we want to take a picture!' As I thought he was where I wanted it to be, I snapped the picture. And at the same time I snapped the picture I heard a sound. And I just uh, I had my picture taken, I was not holding the camera in front of my face. And I heard two more sounds, which I thought were firecrackers." (When asked if she'd stepped into the street to take the photo of Kennedy) "I'm pretty sure that I had stepped back just onto the very edge of the curb, to get off the street, onto the grass." (When asked again about the first shot) "I heard that while the camera was still up in my face. I heard a noise. I heard a sound." (When asked about this shot in comparison to her taking her picture.) "At the same time... Seconds or...awfully quick." (When asked if she heard a second shot.) "I did. Immediately. It was like Pow...Pow Pow. Y'know it was that quick. And, this second shot, I was looking at this man, and my thought was 'I saw his hair jump.' Well, it was his head, y'know, the hair." (When asked if she thought he'd been hit by the first shot) "Yes." (And the second shot.) "Not sure about the second shot other than that I did see something happen to him." (When asked about a third shot.) "I heard three shots." (When asked to confirm that she didn't hear the two shots prior to the head shot described by most writers) "That's right. I guess not. And if there was a first shot, I don't think I would stand there and then take a picture, knowing that I'd heard something." (When asked if she could have been mistaken about the sounds.) "Well, yes, I thought they were firecrackers. I did not know there was a gunshot, no." (When asked if the motorcycles had been backfiring) "No." (When asked if the limo slowed down.) "It slowed down almost if not to a stop, and I saw Jackie. She hollered 'Oh, my God, he's been shot!' I heard that. And I saw her start to climb out over that car." (When asked when the limo slowed down) "After all the shots. There was no more shots." (When asked if she had a sense where the shots had come from.) "I did not." (When asked if she'd seen any shots hit the windshield.) "No, I did not. (Or the pavement.) "No, I did not." (When asked if she had a sense that some of what she'd heard were echoes.) "No, I didn't. I'm not accustomed to hearing shots." (When asked about Jean Hill's claim in her book that a SS agent stole Mary's photos from her--Jean Hill's--pocket.) "It didn't happen." (When asked whether Jean Hill had ever mentioned to her that she'd seen smoke or a man with a rifle on the grassy knoll--as she was later to claim.) "No, she did not." (When asked if she'd noticed anything on 11-22-63 that she now considers suspicious.) "I have no idea." (When asked why she didn't testify before the Warren Commission) "I just told them that I'd turned my ankle and couldn't go, and I never heard from them ever again." (On whether she thinks the Zapruder film coincides with her recollections) "Not really. I appreciate it...It does show that I was there." (If she has an opinion on whether there was more than one shooter.) "No. But I believe there's a whole lot more to the story than what's been told. I don't know about how many shooters or don't really care other than to know for sure what's happened." (Interview of Moorman shown in The Kennedy Half-Century, first broadcast on PBS, 11-4-13) "I'd stepped out into the street twice to take pictures of the motorcycle policemen...The car got closer to us and Jean yelled 'Mr. President, look this way' and about that time, I snapped the picture." (The camera then shows the Moorman photo) "That was the first shot that I heard. I heard Jackie--you know we were so close--and then she said 'Oh, my God, he's been shot.' Well, on the second shot that I heard, I thought how'd some of that man's hair jump? And I'll never forget that as long as I live. It was not his hair jumping, it was his head." (11-18-13 article on Moorman in the Richmond Times-Dispatch) "To this day, she is certain that it was the first shot that hit Kennedy’s head. 'It’s real vivid in my mind, exactly what I saw of what I felt like was taking place. I have not forgotten any of the details,' she said. When the Warren Commission concluded that Lee Harvey Oswald was the lone gunman, Moorman wasn’t convinced. 'I really don’t know what exactly happened, but I do know there is bound to be a lot more to the story that hasn’t been told,' she said. 'I was hoping it would come out in my lifetime, but who knows. So much has been hidden by the government; anything can take place and it can be hidden. Oswald probably wasn’t a lone person, he probably had backers. I really do think it was a conspiracy,' she said." (Video accompanying the article in the Richmond Times-Dispatch, presumably posted on its website on 11-18-13, and then posted on youtube via the JFK Assassination Forum, 11-20-13) "As it got closer to us, Jean hollered 'Look this way, Mr. President, we want to take your picture.' And then as it got closer to us, I put the camera up to my face, to focus, to be able to snap the picture when I thought it was time. And when I snapped the picture, I heard what I thought was a firecracker. And, then people, I could feel that people were falling on the ground and I really didn't know what was happening. But I guess in the second or third shot (I said) 'Get down, Jean, something is happening." And it was over with. We did hear Jackie holler "Oh my God, he's been shot!" And she started to climb out over the back of the car. We were right there, saw it, so close." That memo I posted I think is really important. Because, 1.) The WC had not decided on the SBT yet, and this is late April. 2.) Not just that, but they had the first shot at 190--which is where it belongs I think. But they then pushed it up to about 210. 1. Do you think there is a shot beyond 313? 2. Where do you think the Harper fragment belongs in JFK's skull? IF at all. Altgens corresponds with extant Z-film frame 255. 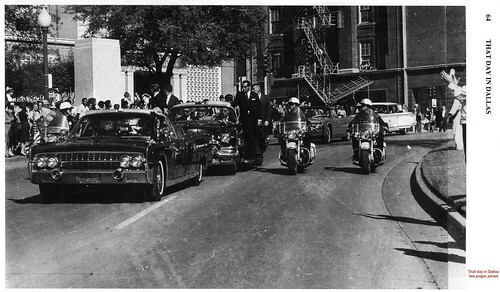 Note Jackie's gloved hand grasping the president's left arm raised to his throat as seen through the limo windshield in Altgens 6. Then note the exact same hand position in the extant Z-film frame 255. It matches to a tee. The Moorman photo corresponds to extant Z-film frame 312. Both of these can be easily confirmed with distinct corresponding "features" within both the still photos and the film frames respectively. As an example one can draw an imaginary straight line from the Z-lens POV to the Moorman lens that passes directly between the motor cop's torso and his motorcycle's windshield on the way to Moorman's lens. At the same time, one can draw a corresponding straight line from the reverse angle--from the Moorman lens POV to the Z-lens--that also passes directly between the motor cop's torso and his motorcycle windshield on its way to the Zapruder lens. I hope that helps. I can post a graphic tomorrow if you want. 2-26-2003. Transcript provided by James Fetzer) (Moorman is standing on the grass where she is seen in the Zapruder film) "I just stepped to the, uh, to the edge here, and Jean is hollering, "Look Mr. President, look our way!" and then I snapped the picture, which was at the same instant, evidently, as the bullet hit him, not realizing that's what had happened. Well this is odd. Moorman talks as though she is taking a picture of the president from the FRONT. Yet her famous photo shows Kennedy from BEHIND. What am I misunderstanding here? Also, I thought she took the photo at the time of the first shot. Wikipedia says it was at Z313, and indeed the Moorman photo looks like ~Z312 but from the other side. (With Kennedy slumping and Jackie leaning over him.) Taking only the Moorman photo, the Z-film, and Moorman's testimony into consideration, it seems like she took the same shot as ~Z312, and somehow thought that what she heard was the FIRST shot, and that for some reason she heard a couple of shots after that. Am I understanding this right? This is confusing. EDIT: Greg answered my second question. (Thanks Greg!) But what about my first question? So, who can see JFK's brains flying skyward in Moorman's Polaroid? Don't be shy, now. "The problem with this hypothesis is that one has to figure out from where the extant Z-film got its frames depicting Kennedy bringing his hands up toward his throat just before slumping. Moorman shows only the slumping part." The same way I created 3x the frame count for this extant zfilm span. There were more to begin with.